High strength, Heat treated alloy steel body for better life. Single acting spring return for smooth lowering. Threaded ram with mechnical safety lock =−nut to sustain load on lock-ut for longer period. High pressure long life seals. bottom mounting holes for bolting. Custom strokes and tilting saddle available n request. 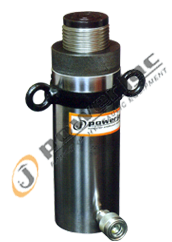 Application : These jacks are an excellent choice for maintenance, ideal for wide range of applications at construction site, mills, railway workshops, power plants, transformer lifting and industrial maintenance whare lifting load is for longer period.